Tiger Woods expects to see a fairer Carnoustie when he starts his bid for a third successive Open title on 19 July. The world number one, who has just become a father, was seventh the last time the major was held at the Scottish course in 1999 - but was 10 over. "I think they probably learned a lesson," said the American. "It was hard. It was really hard. I've never played a golf course as hard as that was set up - and as unfair as it was set up as well." 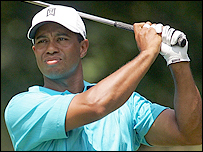 He added: "I remember number six, stepping off the fairway nine yards wide in a lay-up area. That's not a real big lay-up area when you have to hit a four iron. "I think it's a great golf course. I played two Scottish Opens there (1995 and 1996) and I thought it was one of the best golf courses I've ever played. "Lo and behold, we come back in 1999 and it was not that way any more." "The British Open is the only tournament where it's hit or miss on the tee times," he said. "I mean, you can get the good side or bad side. There's usually a distinct side. "If you play well sometimes it may not be good enough because you just may get the wrong side of the draw."